As most of us in the Four Points area and beyond have experienced in recent months, traffic heading west-bound on RM-2222 got worse after re-striping took place on May 9, 2018. The change shortened the right turn lane for traffic headed north on RM-620 and changed the use of lanes causing driver confusion. 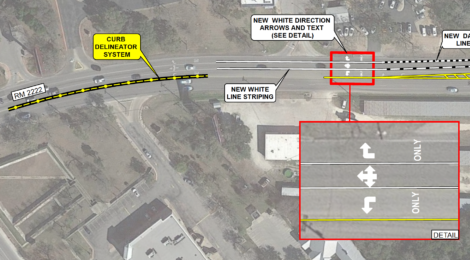 The change was intended to allow safe turns into the center lane from area businesses which previously had to contend with the traffic racing toward the RM-620 intersection. Even after a month of “adjustment period”, traffic never recovered to the original efficiency levels and remained worse at most times of day. SRNA and others reported this feedback to TXDOT and TXDOT decided to address the on-going concern with another round of re-striping. They are doing this soon to avoid overlap with school starting in mid-August. Note: TXDOT is also working to complete re-texturing of RM-620 with a safer texture coat before school starts for the fall (this was originally planned for May but was delayed due to technical issues with the texture mix). “Please be advised that starting on Monday, July 23 during daytime, off-peak hours (9 a.m. – 3 p.m.), TXDOT crews will be restriping the westbound lanes of RM 2222, from approximately the Wells Fargo Bank building to RM 620. This will allow for longer cue lines for traffic turning onto RM 620. In addition, during the evening hours of July 23, we will be adding flexible delineators on RM 2222, to discourage illegal left-turns. The purpose of these changes is to adjust striping to better suit traffic demands. A diagram of the proposed changes is attached. This will address two of the main down-side consequences of the recent changes by re-extended the right turn lane (looks like about 40% longer than present, but not as long as originally), and also using the delineators to avoid driver confusion which also contributed to back-ups and accidents. We will watch carefully to see if traffic patters return to more optimal behavior after the changes (we sure hope so). Please let us know what you see! The feedback we received after the last round of changes especially after the initial confusion subsided was valuable.